The Cyber Knights, Middle Georgia State University's cyber defense competition team, have advanced to the regional level of the 2019 National Collegiate Cyber Defense Competition. The winning institution at the regional level will move on to the national championship in late April in Orlando, Fla. The regional level competition takes place online. The Cyber Knights will compete from the Macon Campus of Middle Georgia State. According to Dr. Nelbert St. Clair, the information technology faculty member who coaches the team, the cyber defense competition is similar to a real business. Teams face a series of real-world situations where students must work together to protect networks. The students find and fix any problems and document their findings to upper-level management while defending the networks against cyber threats and highly skilled hackers. 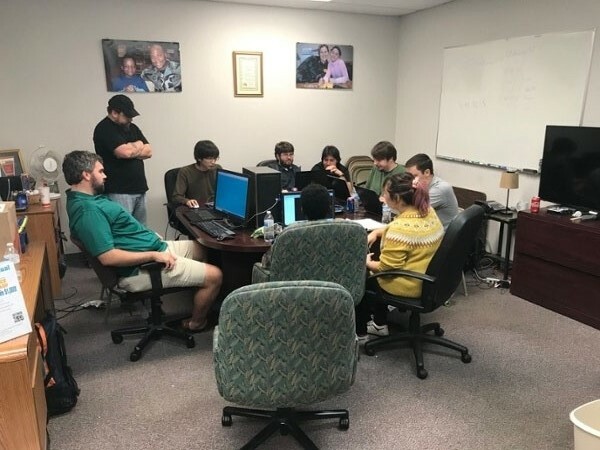 In addition to Corley, Cyber Knights team members are Jason Ellingson, Brandon Israel, Alondra Burne, Austin Cox, Steven Warner, Cassidy McMichael, Victor Fordham, Joseph Jarrett, Dallas Hoffman, Erick Cook, Andrew Chastin, and Meagan Shuttleworth.